Kalle Carlstedt (1891–1952) is known for his brilliantly executed woodcuts that reveal his keen sense of shape and space, the masterfully rhythmical quality of his lines and the sophistication of his approach to colour and shade. Carlstedt often turned to nature for his subject matter, which led to him being described as “the wanderer of coasts and forests”. 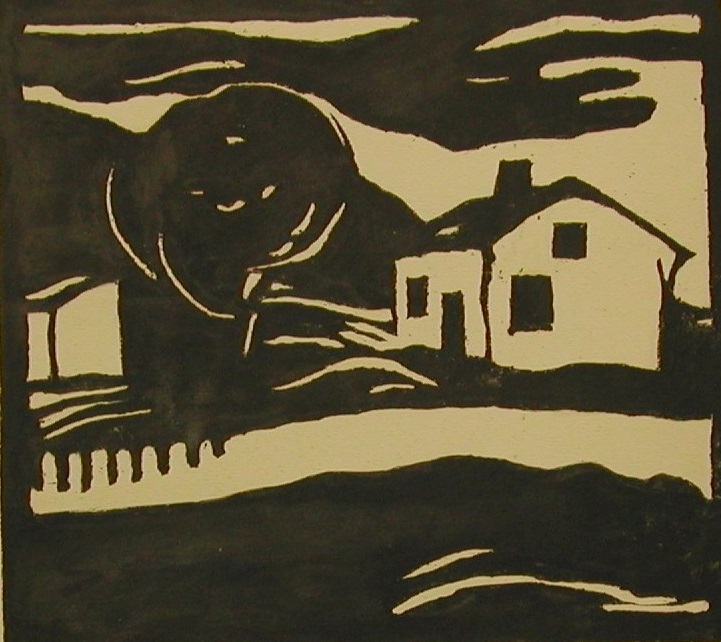 His landscapes tend to be based on the familiar sights around his home in Sääksmäki on the banks of Lake Vanajavesi. Carlstedt’s watercolours are imbued with a sense of humour tinged with a profoundly moving sense of tragedy. He often chose to capture brief, everyday moments, showing us everything from a pauper’s burial and funeral wreath sellers to portraits of young love and even depicting mischievous little elf-like creatures emerging from a well. The exhibition presents some 80 works of art by Carlstedt held in the Hämeenlinna Art Museum collection, including woodcuts, watercolours and bookplates. Kalle Carlstedt, A Cottage and a tree, 1914. Hämeenlinna Art Museum.